The 2019 Ram ProMaster is a powerful and well-endowed cargo vehicle. 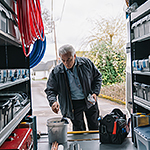 The 2019 Ram ProMaster includes generous amounts of interior cargo space made to haul a variety of bulky loads. That's not all, because the Ram ProMaster also allows drivers to haul even more material in the form of 5,100 pounds of towing capability. This much cargo and towing space allows drivers to move more and thus get more done. It takes a lot of power to move all that freight, and the 2019 Ram ProMaster delivers in a form of a 280 hp, V-6 motor. This V-6 motor kicks out these horses with the help of features such as two-step valve lift and variable valve timing. In addition to the powerful motor, the 2019 Ram ProMaster includes an extended range 6-speed automatic transmission system. The extra gears make changing between ranges a quick and easy experience, and also contributes to increased fuel efficiency.